Since our inception in 2007, ArtsCalibre has endeavoured to provide children with the skills necessary to excel throughout their scholastic careers, while at the same time instilling a lifelong desire for learning. At ArtsCalibre we believe that creativity sparks a child’s curiosity, thereby enabling them to fully open themselves to every learning experience. The Arts are the creative vehicle for this process. Students enrolled in ArtsCalibre’s Preschool program will not only acquire the skills needed to excel in Kindergarten but also the skills needed to excel in a group learning environment. To foster a high quality learning environment classes are kept to maximum of 20 students, supported by an high quality education staff compliment of 2 or 3 persons (depending on day and programming size). Our programs run from September through June each year, and closely follows the Greater Victoria School District’s school year calendar. For a complete list of ArtsCalibre’s Preschool learning objectives, click here. 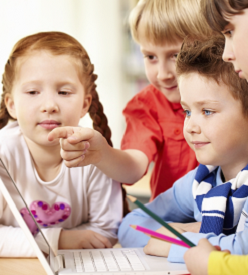 Enrollment is limited to children aged 3 and 4. Please note: Children under the age of 3 at the start of the September school year must reach the age of 3 by December 31st to be considered for the 3 year old program. We suggest that families book a tour or attend an Open House before proceeding with registration, as the registration fee is non-refundable. For information on upcoming Open Houses, click here. Coming soon – Register your newborn! At ArtsCalibre we understand that one size doesn’t fit all. That’s why we’ve designed our preschool programming to be flexible and accommodating for today’s busy family. Families may choose (subject to availability) from 2 to 5 classes per week. Four Class Option: Add Tuesday or Thursday to the "Three Class Option"
We also offer families the benefit *extended hours, with early drop-off in the morning and late pick-up in the afternoon. 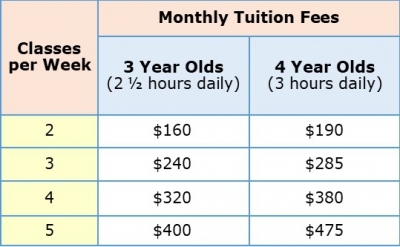 These rates are all-inclusive and represent the total cost of tuition — there are no taxes or any additional fees for supplies, activities, etc. 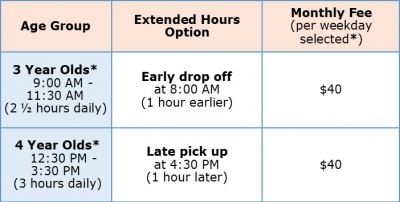 ArtsCalibre also offers families the benefit extended hours, with early drop-off in the morning and late pick-up in the afternoon.